Tis’ the season for Christmas dreaming and decorating, and of course, the fun of gift giving! Yay! I’ve got the dreaming and decorating part underway, and just this week I started thinking about the gift giving. One of my favorite places for online gift shopping is The Vintage Pearl. Erin has so many cute and personal gifts for everyone and every occasion. So today in the spirit of generosity and all things festive, I thought I would share a few of my favorite gift ideas (and Erin has a giveaway for a couple of lucky winners). Are you looking for something for the men, women, teachers, kids, BFFs, brides, moms, dads or (just in case!) your favorite bloggers :-)? You will for sure find something fun and personal for everyone with a quick look around The Vintage Pearl. I LOVE getting surprises and gifts in the mail. :-) So when Erin sent me the adorable customizable deer keepsake ornament, she became one of my favorite people. I LOVE it! We’ve collected many personalized ornaments over the years and they are always such fun memories of Christmases as a family. She also sent me this sweet monogrammed laurel necklace, which I adore! Thanks, Erin! Isn’t it precious? Everything is so pretty, personal and meaningful! Now it’s time to enter to win the giveaway! Two lucky winners will receive their choice of an ornament and a $25 gift card! But here’s the deal, I need you to tell me who is at the top of your Christmas gift list this year and what special gift from The Vintage Pearl you think they would like. Two winners will be chosen Saturday night at 9PM PST. I would love to get something special for my sister. She has had a very difficult year and has kept a positive attitude during some trying times. I would get her the state love necklace for Virginia! I would love the bitty blossoms necklace for my daughter. My wife is at the top of my list–always–but second this year is my 21 year-old daughter who is working with disadvantaged young people in Northern Ireland. I would love for her to enjoy the Vintage Map Bracelet to remind her of those who love her back home. Hello from DC! The person that’s at the top of my Christmas list is my sister, Kalee. Since I moved to the east coast from Oregon, we’ve grown so much closer! I’m super excited to head home for Christmas, and I’d love to surprise her with the leather journal. I chose this because it’s unlike anything that she would buy for herself. Thanks! 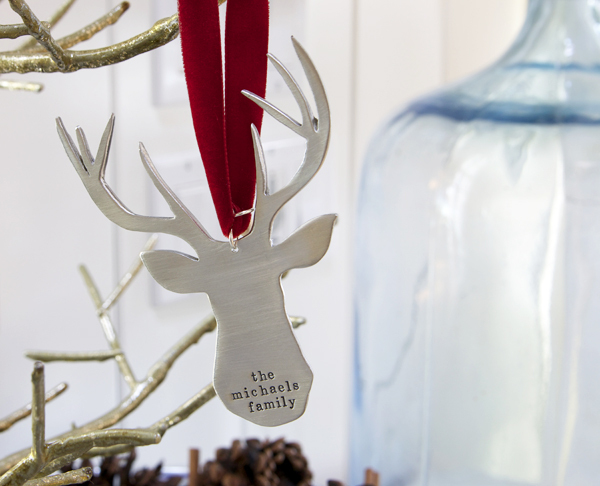 The personalized deer ornament would be perfect for my parents! They had their tree tip over and lost a lot of treasured ornaments, so this would help to fill the tree back up! My mom would love that monagrammed laurel necklace! My parents & in-laws are always at the top most precious people in our lives but gift giving is getting a bit harder each year so the personalized deer ornanment would be perfect! My sister is at the top of my list. She would adore the deer necklace with aqua bead. Her husband is an avid hunter/sportsman and the bead would remind her of those trips to Texas to visit me! Nothing better than sisters! My sister. She would love the pearl charm bracelet. My mom is at the top of my Christmas list this year. Last year at Christmas she was in a coma because of a traumatic brain injury but now, after months of hard work and rehab, she is walking and talking again. We are truly blessed to have her alive and well. The blessed mom necklace would be a perfect gift! My bff is at the top of my list. I would get her a necklace with the world on it, as she plans to do mercy ships one day. I would love to get my daughter that beautiful laurel necklace!!! My sister is #1 this year. Texas has always been her favorite, so I would love to give her the home state love necklace. I love my Vintage Pearl necklace, they do beautiful work. This year our daughter is turning 16 (next month) and her and I are going to enjoy a special getaway, just the two of us. I want to give her something special on this small trip and I am looking forward to picking out a special piece of jewelry for her. Not too sure the exact piece yet, but something just right for her and this time in her life. My daughter is at the top of my list. Each year I give her a special ornament on Christmas Eve. She loves elephants, so when I saw the sweet elephant ornament I knew without a doubt that had to be “the one” this year! Thank you to you and The Vintage Pearl for this giveaway! I would get something for my mother-in-law who helps out a ton and has had a tough year. I would get her a bracelet with all of her grandkids names on it. My daughter would love the laurel necklace! I would get my mother something nice. She was recently diagnosed with cancer and is taking it very hard. Either the bracelet and put the grandkids name on it or the blessed mom necklace!I feel I am already blessed to still have her here! My husband. He’s not a big jewelry person, but I think he would dig the simple cuff bracelet with our boys names one it. Such cuteness! I would get the ladybug necklace for my grandaughter. Custom Leather money clip for my hubby. What cute and unique gifts! The person at the top of my list would be my friend, Pam, who is like a sister to me. She is an amazing woman of God who has raised her own three children, adopted two with special needs, and is raising her autistic grandson. I would so love to bless her with one of these gifts. I love the Vintage Cross necklace. My husband. I like the leather custom money clip. I could find so many great gifts for mom and mother-in-law! My mom will be in Mexico over Christmas and misses the family, snow and the season in America. A special gift to remind her that she is loved and missed. My mom! The vintage snowflake ornament is so cute or maybe the thankful necklace. I love the leather journal and I would get it for my Husband. He is amazing and we have written each other on and off over the years since he went to basic training. He came back into my life after my divorce and we started writing again. We married and continued to write letters (in an age of technology) 2 years ago. We wrote through a deployment and living apart for the first 18 months of our marriage. Now we still write love letters (it was even in my vows: I promise to always write you letters), however we share a journal we write back and forth in. We write love and we write frustration and we share life on paper and in person now. He is amazing and an amazing bonus Dad to my two girls. I am so loved. My single sister is at the top of my Christmas list this year. She is in her forties and has never married but has longed to be a wife and mother. She always remembers everybodys birthday and gives gifts to all 17 nieces and nephews and siblings and in-laws. I think the vintage laurel pendant would be a nice gift for her. So many beautiful things! I love the ornament and I know my daughter would love the chunky bead bracelet! My daughter is at the top of my list. I think she would love the gold, leather and pearls bracelet. Thanks for chance to win. My soon to be daughter in-law!! 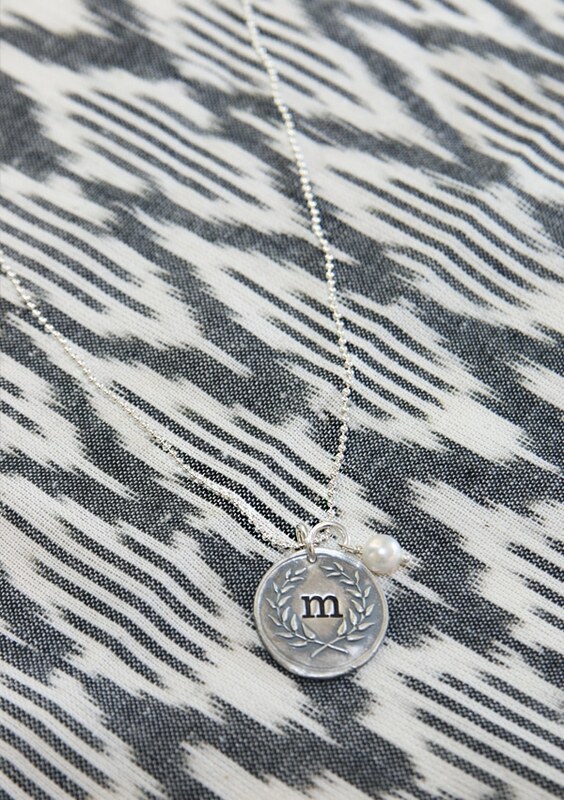 A necklace with her married initial M!!! My Mom! She deserves something personal and special. My daughter Kaya is at the top of my list. She is a new wife and mommy and love hand stamped jewelry. She loved the necklace I gave her last year from the Vintage Pearl. I know she would love the deer ornament! Both of my sisters would LOVE the eclectic charm necklace with their kids names on them from The Vintage Pearl-I love all of her unique items- thanks for sharing this site!! oh my gosh, the globe, i NEED that globe necklace! and the boyfriend is always at the top of the list, but he’s the hardest to shop for. My mother in law is at the top of my list and she is hard to buy for but I know she’d love something meaningful from the Vintage Pearl! My kids are always at the top of my list. I mean aren’t they on every parents but this year I’m also looking for an extra special gift for my bestie who just had her first child. A personalized necklace with Marleys name on it would be perfect. Top of my list is my dear husband … it will be just the two of use this Christmas morning while our children celebrate with their other parents (blended family here). It’s always challenging to find something he will treasure and appreciate, but I think a money clip would fit the bill! My youngest daughter just had her first baby so I would get the charm necklace with her baby’s name on it. She would love that. At the very top of my list is my grandson Arthur, but since he’s only 2 this isn’t the place to shop for him. But for his mother, my beautiful daughter, I was struck by the treble clef charm necklace, because she and I sing in choir together, and she is taking piano lessons as an adult (after fighting them as a child so that I gave up after three years!). Thanks for pointing us to this lovely site in time for Christmas shopping. I would love to get the leather bookmark for my fiance. My mom is at the top of my list this year, she has been there for me these last couple years when I’ve needed her most, judgmental free. I want to get something special for her to say thank you and to hold close to her heart. When skies are gray(with initials) necklace is the perfect choice to say I love you, and thank you and I personally adore it. She’ll probably tear up but that’s exactly what I’m going for! This is a great website thank you for sharing! My girls… I really like the simple heart rings for them. I’d love to get something sweet for my daughter-in-law – she’s carrying my grandchild and that makes he love her more! My sister has had a rough year…I’d get her the cuff bracelet with my niece’s name on it. My mother (soon to be grandmother) and my sister in law (soon to be mother) are at the top of my list! So a piece of jewelry with the new baby’s name on it will be perfect for both of them! a close friend – maybe a cuff. so many good things to choose from! My husky Zach would LOVE that leather journal!! My mom! I would give her the spoon initial charms with her two grandsons’ initials. I have so many people on my list, but I think the leather bookmarks would be so great for a couple of teachers who are working extra hard with my son this year. My daughters ,ages 13 & 12 are on the top of my list. Now that they are older it is so much harder to buy for them. I love the Vintage Locket at The Vintage Pearl. The ornaments are gorgeous! Love the deer head and especially, Santa’s List! My mom is at the top of my list. She would like the Our Christmas Family Tree Ornament. My son’s girlfriend has brought so much joy to our family this year! I’d love to give her the Simple Heart Ring! My mom would be at the top of my list. I have a part time job and she drives over to help care for my son. I am so thankful for her help and think a beautiful necklace would be what I would choose. My friend Kim,and I think she would love the silver drop earrings. I would love to get the Vintage Earth Charm necklace for my newly married daughter. She has spent the last several years working in other countries to make a difference to those in need. She continues to do that now in the U.S. I think this necklace represents her “heart for the world”! My husband is at the top of my list! He’s in seminary right now, so he is constantly reading a stack of books at any given time. He usually uses scraps of paper for bookmarks. I’d love to get him one of those leather bookmarks!! My daughter is at the top of my gift list and the vintage earth charm necklace would be perfect for her because she wants to travel the world when she is finished with school. I’d love to get my daughter that world necklace! She’s dreaming of returning to India to serve in a Christian children’s home where she spent part of her summer after graduating high school. I saw so many things that are just precious…. no way I can decide this quickly which is my fave. All my children and grans are at the top of my list… and so many of the items would be perfect for them. I want to get my mom something special and she would love a necklace with all her grandkids names on it!! My mother is at the top of my list. She just moved back from Arizona, living out there for five years. While living there she broke her ankle in a very bad break and could have lost her lower leg. She is a native to Florida and I am so glad to have her back in our home state. The Home State Love Necklace would be perfect for her. My mom is at the top of my list and she desperately wants the vintage initial charm necklace this year! The kiddo is at the top of the list, surprise surprise, eh? My girls would love the “cup of love” necklaces! My sister, having a rough time and dreams of living in North Carolina. So State necklace for her! My best friend is at the top of my list and I would love to get the A Full Heart Bracelet from their site for her. My daughter would love the world necklace. She enjoys travel around the world and this necklace is perfect. My daughter, she had her 3rd boy Tuesday. Would love to get her a necklace with the 3 boys names engraved! ! Eclectic Charm Bracelet for my Daughter. She would love it! My daughter, and my daughter-in-law would love personalized items for Christmas! My three daughters are always at the top of my list. I would get my oldest the state love necklace–she leaves for college next year! I would get personalized ornaments for my younger two daughters. My sister is at the top of my list. It has been one thing after another medically for their family. Plus she would just love one of the ornaments that can list the names of everyone in their family! So beautiful! My daughter would love the vintage initial charm. My mom and my sister! They would love the monogrammed necklaces! I would love to get my daughter a special personalized gift. She is a new first time mother and has had a hard time balancing work and mothering. My husband and my two little girls are at the top of my list. I love the keepsake journal for my husband and I love the idea of the girls each having a special spoon with their own name on it. This is my nephew’s first Christmas and I think the hand stamped baby spoon would be great for him. My mom is at the top of my list! She does so much for me and my family and I’m always looking for little things she might love! I think she would love that deer ornament! My daughter is at the top of my list and she would love the pearl bracelet! I’d love to get the rugged cross for my husband! I would love to get ‘grandma’ necklaces! I would love to get my sister in law a customized necklace with my nice and nephews names. Both of them were adopted and both my brother and sisiter in law have had many difficult years. I would also like to get a good girlfriend of mine one of the necklaces as well. She has been one of the most amazing Christian influences in my life and I value her advice and respect her a lot. Would love the deer ornament for my daughters family! My family doesn’t celebrate Christmas, so I’d get myself a gift! I like the “i love you to the moon and back” necklace b/c my son and I say that to each other. Our 12 year old Golden Retreiver, Kellie-Anne, is at the top of the list this year. She has cancer, but is 9 months into chemotherapy with no side effects and feeling great. She recently tore the meniscus and Cruciate ligament in her left knee, plus dislocated her kneecap. She has a custom made brace and is going to physcial therpay twice a week. Helping her feel better is our Christmas gift to each other for my husband and I. Of course, Kellie-Anne and her twin sister, Honey-Rose, will still get their stockings filled on Christmas morning! My future brother and sister in law are getting married in next May. They are huge hunters and love deer themed things. I would get them the feet ornament. My sister is at the top of my Christmas list. I would love to have their pearl bracelet. Big READERS at our house….we would love those bookmarks, too! My sweet Aunt is at the top of my list & I think she’d really love the Gold, Leather, and Pearls Charm Bracelet! thank you for the chance to win! My husband is at the top of my list! I would love to get him something extra special! My daughter is always at the top of my list for every occasion. She such a loving, compassionate person to her family, friends and anyone who may need her. She loves her two sons so much that the golden rectangle name necklace would be the perfect gift for her this year, It would keep them close to her heart. My daughter and myself-matching laurel necklaces and an ornament for her first tree in her new home. My fiance is at the top of my list. It will be our first Christmas in our new home so I’d love an ornament to commemorate the occasion. I like the Family-Wreath-Ornament. My daughter-in-laws are first on my list and I love the southern belle necklace for them. I also have a friend whose son was in an ATV accident and a long road ahead for her caring for him. I thought how great to give her the rustic cross HAVE FAITH necklace. My oldest daughter would love the monogrammed laurel necklace! My daughter is at the top of my list this year. She moved to the Midwest in August and we miss her a lot. I would get her the earth charm necklace since she loves to travel. My son and daughter in law and their new baby are at the top this year. I really like the baby feet pendant or baby’s first Christmas ornament. I would buy the Christmas My Dear ornament for a very dear friend’s farmhouse. Her boys all hunt deer and have an animal room. My husband top my list…when I saw that cuff band with Philippians 4:13 on it…I knew just what to order! My sweet husband is at the top of my list… we just adopted our first baby boy, and getting him something personalized and meaningful to celebrate our first Christmas as a family would be so nice. Maybe a new ornament like the deer? I immediately thought of my SIL, who I love as a sister, when I saw the world necklace. She and my brother and their family are missionaries and we miss them, but thankful for what they are doing for God’s kingdom. Hello from PA, first I want to thank you for your blog and secretly I am in love with my home. My daughter is at the top of my list and the VINTAGE LAUREL necklace would look wonderful with her long hair. She loves vintage jewelry! I’d love to get a personalized necklace for my mother-in-law, who is so good to us! At the top of my list would have been my mom but she is in heaven. So my BFF, Shelley, is now at the top of my gift giving list. She would definitely like the Southern Belle Necklace. She was born in the South but just moved to Tennessee in February. I miss her! We still talk and text. I will be seeing her at Christmas. Would love to be able to give her the necklace at Christmas. The kids are at the top of the list (of course). 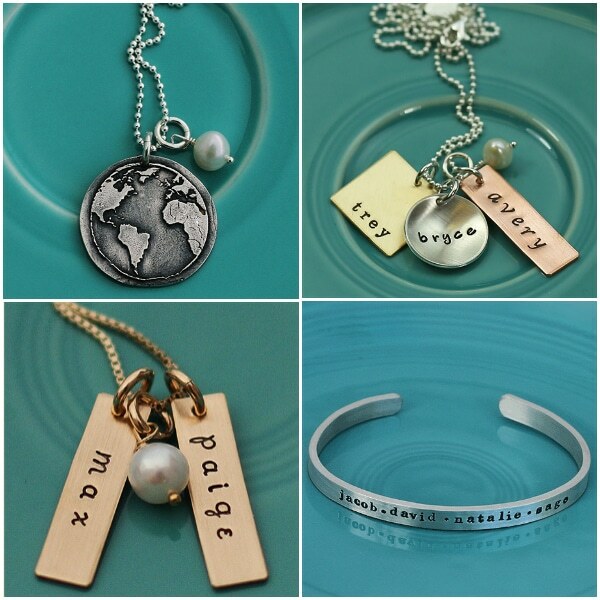 Love all the personalized necklaces from Vintage Pearl! My 2 wonderful daughters-in-law! Probably the laurel wreaths. So many pretty items so it’s hard to decide. My 2 daughters are on the top of my list this year. Their Dad, my husband, passed away in January and I am looking to give each of them a personalized ornament for their trees this year. My husband is at the top of my list! I think I’d get the deer ornament because it could remind us of the trip we took to Colorado in 2014. My sister who now lives far away from me. I would like to give her a leather and pearl bracelet maybe witch both of our initials on it so she can always have me close by and know that I am there for her.